Post frequency is a topic that comes up often among bloggers. It doesn’t matter if you’ve just started or you’ve been posting for years – people change, algorithms change, and even your motivations for blogging change. No-one is immune from wondering if their schedule is working, or if tweaks can be made for more successful audience interaction. 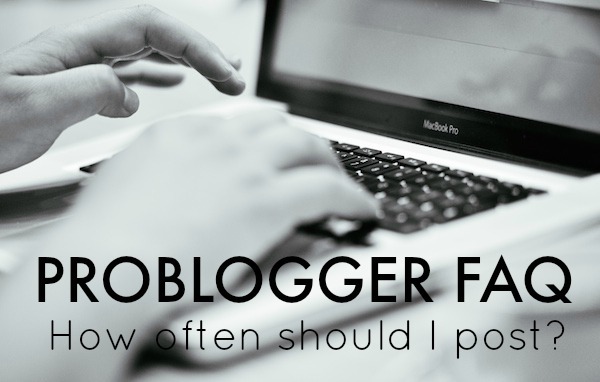 As I said in my previous FAQ post on how long posts should be – it depends on several factors. The length of posts, the frequency of posting, and definitely post content all require trial and error, and for the blogger to know what their readers respond to best. There’s been a shift I’ve seen lately – two shifts, actually – in posting schedules that work for certain bloggers posting certain content. There’s the shift toward following the Upworthy/BuzzFeed model of 10-20 posts a day, and others doing slow, longer, deeper posts. The choice can even depend on your monetizing model. If you are dependent upon banner ads, your’e going to need more posts. More eyeballs mean more clicks, which mean more money can be made that way. If you’re selling a product or service, then you’ll do better with slower paced, deeper content. You’ll notice that’s what we’ve been experimenting with here on ProBlogger recently. Finding a posting schedule requires some homework on the part of the blogger – checking their Analytics to see what posts work best, what times work best, and at what speed. You can canvass your audience for their opinion outright by asking them on Facebook, email newsletters or including the question in your regular surveys and make your decision based on their answer. You also need to canvass yourself – how many posts can you reasonably fit into your schedule before quantity overcomes quality? In this post on How Many Posts Should a Blogger Post I go into detail about the pros and cons of daily blogging, which might help you make your decision. Of course there are benefits of both, and sometimes it can take a while of testing before you find which works best for you. You might also find this post useful where our guest writer Ali Luke discusses the surprising answer she found to the universal question. Have you struggled with this? Or have you found the perfect posting schedule? I’d love to hear in the comments.